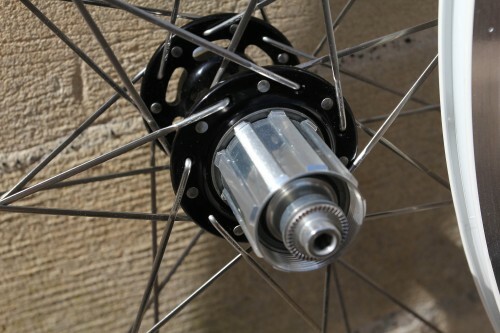 These hubs – £140 (fr), £350 (rear) – are lovely. Sorry to get all technical on you so early – it’s an engineering term meaning they’re superbly designed and work marvelously. Chances are you’ve heard of Chris King headsets and you know that they have a reputation for lasting forever. And they do. They’re precision-made and require very little attention to stay running as smooth as you like, and these new R45 lightweight hubs are similar. What’s so good about them? Well, for a start Chris King manufacture their own stainless steel bearings to a very high standard. They run super-smooth from the off and virtually never need replacing if you look after them. The real action here, though, comes in the shape of the RingDrive engagement mechanism in the rear hub. Rather than a standard pawl-type freehub design (where the spring-loaded pawls engage with teeth when you pedal forward, but are pushed inside when you don’t), Chris King use a pair of toothed rings that engage around the full circumference of the hub. They slide over one another when you’re not pedaling forward, but a spring ensures they engage when you put the power in. And rather than the standard 24 teeth, you get 45 titanium engagement teeth here. That’s fewer than the mountain bike version which has 72, but it still means that they catch that much faster than usual. With 45 teeth, there’s just 8° of rotation before engagement, so you never get much of a delay between starting to move the pedals and applying the pressure to the rear wheel. Okay, it might not sound like much – and, to be fair, it isn’t that much – but everything is more immediate when you jump out of the saddle to steal a march on your ride mates. It’s just better. Oh, and it’s quiet when you’re freewheeling too, with just a satisfying whirr to accompany your descents. 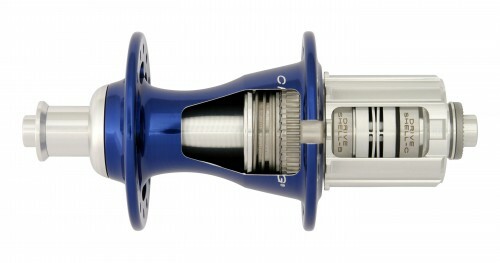 The other thing we really like about Chris King hubs is that it's easy to get in there to give them a quick once over. Open them up with Allen keys and give them a clean and re-lube every few months, adjust the bearing preload and you’re good to go again in minutes. It’s simple, even if you’re not mechanically minded, thanks to the instructions on Chris King’s website. Weighing 102g (front) and 215g (rear) – manufacturer's weights (ours came built up into complete wheels) – the R45 hubs are light. You can get lighter but durability is obviously a key consideration here – these are a long-term investment. They’re available with a Shimano/SRAM freehub body only and in nine different colours. Importers Evolution will be keeping 32-spoke hubs in stock although they can custom order other options if you prefer (24- and 28-spoke at the rear, the same plus 20-spoke at the front). Clearly, not many people are going to spend the better part of £500 on a couple of hubs, but if you’re a racer and you want some high-quality componentry at the heart of your wheels, these should last you years.